So far, I really like that I can use the app and my phone to check my glucose with my sensor. This makes checking my glucose a lot more convenient and I can check it several times a day without having to carry the reader with me. The only reason why am not giving it five stars is because it does not have the ability to sync with the iOS health app. I hope they can make this happen in the future. I switched to my iPhone as the meter to make it easier to quickly check my blood sugar - and I’m here now in a low blood sugar daze. I asked for my phone to quickly swipe over my little pod to check. And I’m here constantly hitting the check glucose button and it won’t go through. I restart the app and my phone and it still won’t work. I’m trying every button, and it won’t work. I have 6 days left on my sensor. Can someone PLEASE fix this bug in the app? I have contacted abbot regarding their freestyle libre as well as apple support and tried all the fixes and ideas they suggested. Nothing. 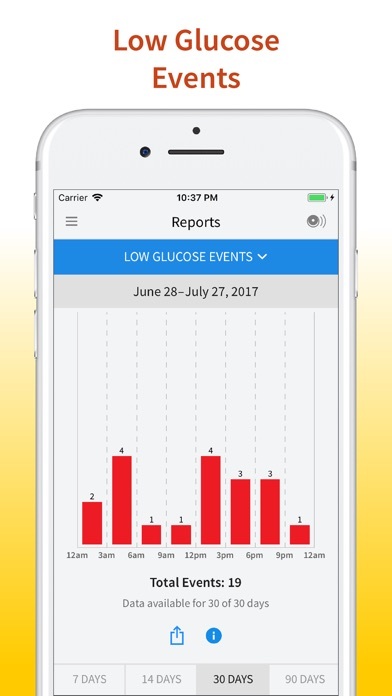 iPhone 7+ using this app does not connect with glucose meter. The reader that comes with the meter does work. Apple support says my phone is functioning fine and no reason it should not be able to connect. The reader scans easier but the touch interface is horrible and unresponsive. It’s much easier to see and interact with the app, so I’m very grateful for it. However, I was forced to spend over $800 to purchase an iPhone because there is no android app and the reader is so poor, but also because I wanted the convenience of consolidating the reader into my phone, less to carry and think about. Please please release an Android app! Using my iPhone as a sensor and it says incompatible sensor. I have been using this for about 4 months now and it worked great at frist but now when i scam my sensor it says try again in 10 minutes I don’t have time for this !!!!! This app stopped reading my first sensor after less than a day. When I woke up, it gave repeated errors. The "last 24 hours" graph showed impossibly low readings (which a conventional test confirmed were highly improbable). It's possible the sensor "lost its footing" or failed some other way, but I didn't do anything strenuous, just got a good night's sleep. Others have reported in these reviews that the dedicated receiver can continue recording measurements when the app can't. I don't have a dedicated receiver, though. just this app. Based on other reviews, the app is clearly buggy. I now need to replace the sensor and get the receiver, but that poses a problem. If I replace the sensor and pair it with the app, I won't be able to pair the receiver – when I get it – because of the weird requirement that the receiver has to be paired before the app. Then, several hours later, the sensor began giving readings again, though they don't (yet?) match up with manual testing. I love this technology and really want it to work, but this is off to a rocky start for me. Just started using the app and haven’t yet tried the reader. Was surprised that since I had started the sensor with the app I couldn’t use the reader at all until the next sensor in 2 weeks. There isn’t any way to export the raw numbers, this makes it very difficult to do any additional analyses. Doesn’t allow hand entered bg test numbers to be removed or edited. The app doesn’t have a way to enter insulin numbers. Worked for a couple weeks and died 5 days into this sensor. Reader works just fine on sensor. iPhone just won’t scan. No support or trouble shooting available in the app. No support number to call. Disappointed. 3/18. Second sensor doesn’t work with app either. Solution from Tier 2 support is to keep buying sensors. This app is crap. Not sure it’s worth continued use. 3/21. Response to this from developer is faulty sensors. Sensors work just not with app. It’s an app problem they won’t acknowledge. 3/22. Still insisting every sensor is faulty and refusing to realize they work with the reader just not with the app. Rude customer service. I have always considered diabetic monitoring a pain. Trying to remember to frequently monitor by glucose levels during the day was always difficult at best. So I tried this system and in 14 days using the sensor and app I captured more readings then I ever have in my life ( which will make my doctor happy). I would love to see this app integrated with apple HomeKit in the future so it will allow me to share with other health related apps. Also would love to have options to designate reads before / after meals (actually have check boxes or drop down selections for each). Also maybe in the future Apple Watch support. Let me start off by saying this product should be rated 5 stars and this review is only to point out the one flaw that shouldn't be overlooked in a leading technology in its field. Please note that on the menu option there is an option to "Share". After attempting to click the option, I am prompted with " Sharing options are not currently available in your country." As this product is made in the United states and my settings are configured for United States, there should be no reason why I don't have the ability to directly share information regarding flaws. How am I supposed to share my data with my doctor? I'm in the U.S. I can't export MY OWN DATA nor does this app sync with Apple Health. Makes no sense to me at all. I am a type 2 Diabetic & I let my diabetes get out of control because I was tired of sticking myself 4+ a day. I not have the Freestyle Libre & it honestly changed my life! It’s so easy to use and I am now 100% in control of my diabetes! Thank you for making such an amazing product! I would like to be able to share the data from this app and send it to my doctor. There is a website you can download from your reader device but not from your Apple phone app. The sharing option says that sharing options are not currently available in your country. Just need that option available to be a 5star application and a complete product. Please enable this apple app to share data with doctors. Thank you. I love the freedom this gives me. However I just switched over to the 14 day sensor and when I scan it the app still says that it will end in 10 days. So either there’s a glitch or my pharmacy gave me 10 day. I can’t tell on the sensor box. It says nothing about how many days. Anyway I love being able to use my phone. First off and full stop- thank you for allowing me to read the sensors directly from my phone!!! That is a blessing and a half and probably my biggest lure to switch to Freestyle Libre. I wish there were more access to the passive sensor data from within in the app, not just as emphasis on my initiated scan numbers, but I am glad to see that the web portal allows me to access and download that passive readings data for myself. Seeing the graph is nice, but seeing the numbers for the passive historical data would be nice too. But then, personally, I’d rather see it all get dumped into HealthKit like all my other health apps, but until that happens I’m glad to at least see an app that lets me check my glucose entirely on my phone, add notes for food, exercise, and insulin, and then see the trends in my glucose readings as they all interact with each other. Would highly recommend to anyone looking for a simple to use, but powerful tool to manage their diabetes. First of all, I love the app. There are some things that would make it a lot more usable. My main complaint is the inability to change the scale on the glucose graph. Adding comments after the fact would be nice. As would scrolling back-and-forth through the graph. 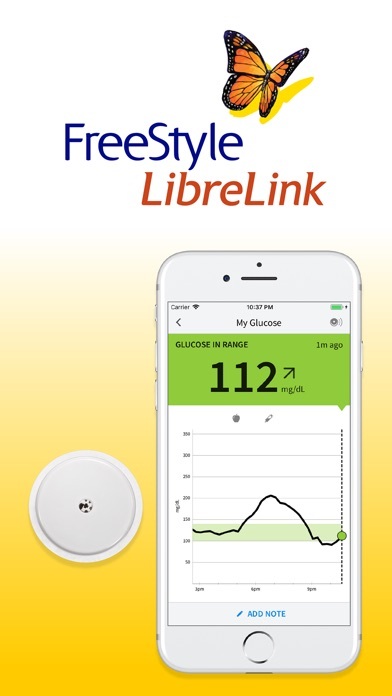 I’ve been using the Libre sensor system for a few months now and just recently came across the app. I have been extremely impressed with the app. There haven’t been any bugs or crashes as of yet. It’s a really great way to check your blood sugar often without the need to carry a separate meter. Doesn’t work with my iPhone. 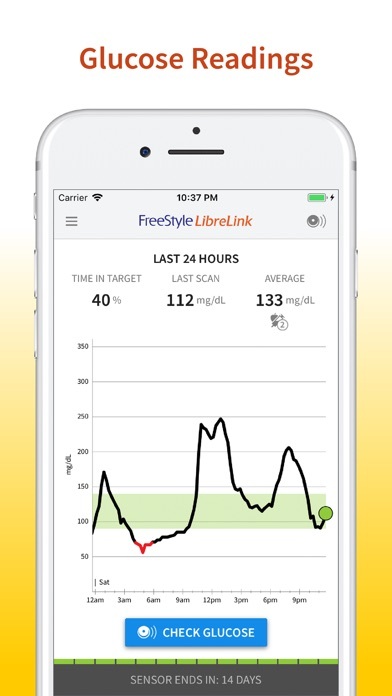 The Freestyle Libre is the best thing to this the market. I totally dislike finger picks to the point I just did not do them. This has freed me from them and not can properly monitor. Things I wish for, Apple health integration. Android support with google health and Samsung health integration as well. Thank you so much. 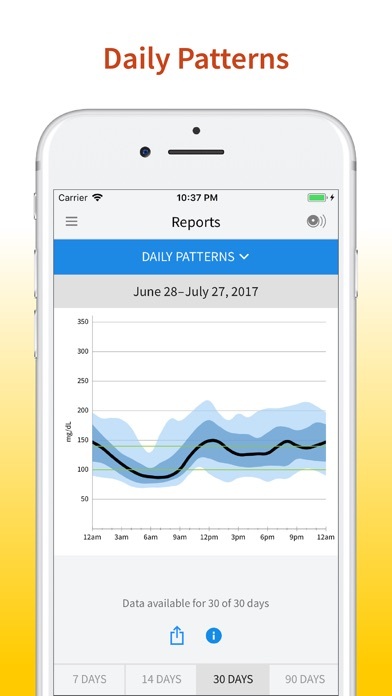 I got my CGM a couple weeks ago, but I never realized there was an app that would monitor it for me until I saw a TV commercial for it. It’s nice to not have to the separate scanner in my pocket, and the app is fantastic! I just started using the system. I would give the app five stars if it would share data automatically with the Apple health app. I’m very surprised that it doesn’t. Otherwise I’m very impressed. I hope and a future update, soon, I’ll be able to give it five stars. Doc asked me to try this technology. I love the convenience of using the iPhone. BS varies by about 10 pts. However, the iPhone app does not allow for reporting using product software or standard file exports like PDF, Excel etc. or share capabilities. Report feature is only available by using the product’s monitor. It would be great to add this to the app. Not sure how I will incorporate use in my daily maintenance. I am not exactly anxious to add one more manual chronology to my day. 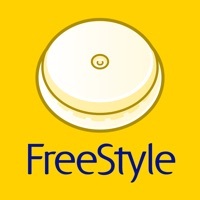 I have been using MySugr. Import to that and like apps would be great but I understand non-partner propriety issues around that action. Are you planning on making this app compatible with the Apple Watch and the Apple health? Hi, I’ve only been wearing the sensor for a day and I’m already in love with it. I love how it shows me what my day has been like. My only criticism I that I cannot find any way that this integrates with the Apple Health App, my past glucometers all synced with Apple Health and I loved seeing my other health metrics along with it. I hope this gets fixed soon. I love being able to use my phone to take readings. That’s a huge step up. But the app itself leaves much to be desired. Such as: The ability to send the phone data to my Dr and not just a day at a time or a total summary. Like the “modal day report” from the auto assist software. She needs to see a summary of day to day information and she can’t get that unless I use the reader. Which defeats the purpose of having an app. The ability to calibrate if required. Everyone is different and different spots on the arm can also vary. We should be allowed to calibrate if necessary. With this sensor my readings are regularly 15-20pts lower than blood readings (with the 15 min delay and during stable periods). Syncing with apple’s health kit, Fitbit, myfitnesspal etc. When these apps work together to sync activity and carbs, life is easier. Just syncing would health kit would be enough to add activity levels and (more importantly) carbs eaten. Add this information twice on different apps is unnecessary and annoying. The ability to scroll over the line and see readings at any given point. The data is there so why I can’t I see it? These features would make the app more competitive with others for CGMs and glucose meters. I hope to see some updates soon. Ok, there is a note that pairing sensor with a phone prevents it from pairing with a reader or any other device. This is clearly a software issue that company is reluctant to fix. My phone went dead after 2 days of being paired to a sensor. According to technical support, I have no options but rip and throw away the sensor and starting a new one. They won’t send replacement sensor either. This should be fixed. Any device could fail, lost or stolen. The has to be an option to pair another device as with other medical devices! For five stars add the following. 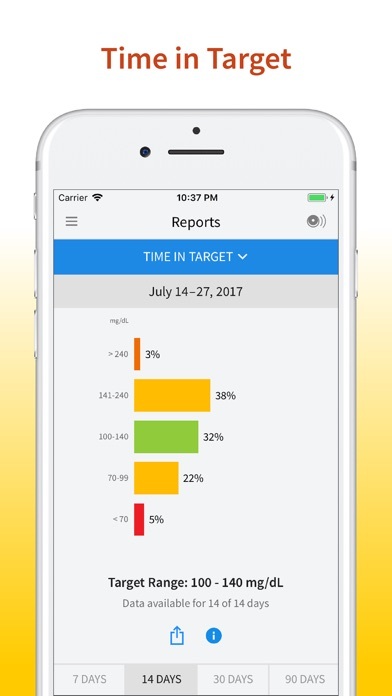 - support for the apple heath app to use your app as a source for health data. - allow scans to be done with Apple Watch. It has the necessary nfc technology. -Set longer term reminders that are longer than on hr. 6 would be nice so we don’t loose data. - last improver sensor to hold 12 to 24 hours worth of data. Great app and good luck. Ps. Set up a way to share all data with drs office through internet connection so drs can monitor numbers more often with out a physical appointment. This is my third patch and the app keeps telling me to put in a new sensor. That 80$ wasted because this app wasn’t working! I am so upset right now! FIX THE APP!!!!!! The on boarding system is nice. Certain fields would be better if they were optimized to use iOS features, like auto fill and strong password suggestion. The scanning parts works exactly as described. As others have already mentioned, Apple Health integration would be a great thing to add on next. Could access to this app be given to EMT’s, Pararmedics, and other first responders so that users of the Libre system would not have to undergo a finger stick if they required medical care and did not have their scanner with them? This sounds like a very good system, but allowing First Responders the capability to access a person’s scanner would prevent unnecessary finger-sticks from patients that did not have their scanners with them. This would allow better and more rapid care for the diabetic patient. I like the app as I don't have to carry around my reader if I choose not to. I only wish it shared the data to the same online account I use with the reader (LibreView). Being a global traveler, I originally got my sensors from Asia. I have a US phone and I can’t use this US app because it won’t read the sensor and I can’t download the European version because it’s not available in the US. I thought this technology was amazing when I first got it but now that I can use my phone and not carry a meter...wow. This makes you want to check your blood sugar more often and it connects directly to my doctors office. I don’t even need to take my meter to the doc.